What are your favorite resources for addressing the ISTE Standards for Students? 1. What are your favorite resources for addressing the ISTE Standards for Students? 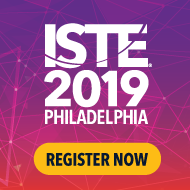 My name is Diana Fingal, and I'm the director of editorial content for ISTE. Our member magazine, Empowered Learner, features a list of favorite resources from ISTE members. We'd love to hear about your best resources for teaching the ISTE Standards for Students (iste.org/standards/standards/for-students), which were revised in 2016. We'll publish a handful of reader responses in our magazine, so please fill in your email, name, school, town, state and country on the form below. No need to answer all the questions. It only takes a few minutes!